Three Sisters: Natalia Payne, Heather Wood, and Wendy Rich Stetson; Keith Reddin in background. Photo © Joan Marcus, 2011. 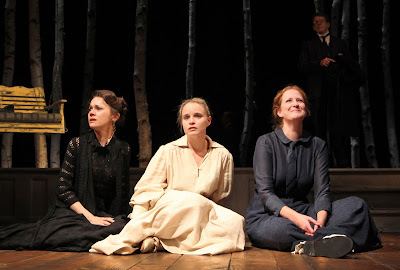 Just like the Three Sisters who find their way of life fading away, so many versions of Anton Chekhov's play find themselves forgotten in the face of modern theater. Not so, however, with Yale Rep's co-production with Berkeley Rep Theatre, for which playwright Sarah Ruhl finds a memorable balance between the classic and modern audiences in her version based on a literal translation by Elise Thoron with Natalya Paramonova and Kristin Johnsen-Neshati. Ruhl tells the story, but focuses on emotions and humor that transcend the decades from when the play first was produced at the turn of the century. In late 19th-century Russia, the three sisters, Olga (Wendy Rich Stetson), Irina (Heather Wood) and Masha (Natalia Payne) long for Moscow while coping with their boring country life, made bearable only by soldiers stationed at a nearby garrison (whether one has a moustache or not is quite the cause for excitement). Their brother, Andrei (Alex Moggridge)gambles away their financial security while allowing his unkind, social-status aware wife, Natasha (Emily Kitchens) to take charge of the household when she isn't having an affair with the head of the local council. Masha, stuck in marriage to nerdy teacher Kulygin (Keith Reddin), has an affair with the married Lt. Col.Vershinin (Bruce McKenzie). Olga finds herself filling in as headmistress at the school where she teaches, and watching out for her old nurse, Anfisa (Barbara Oliver), whom Natasha regards as useless and threatens to throw out of the house. Irina, the youngest, is the most optimistic about life, but eventually settles and accepts a marriage proposal from Baron Tuzenbach (Thomas Jay Ryan), whom she doesn't love. Rounding out the soldiers paying visits to the sisters and their elderly friend, Ferapont (Richard Farrell), are Fedotik (Brian Wiles), Solyony (Sam Breslin Wright), Rode (Josiah Bania) and army doctor Chebutkin (James Carpenter), who once loved the girls' mother. Chekhov's play, in four acts, is a study of the search for meaning in a more modern world. Ruhl manages, in her three-and-a-half-hour version, to make us put ourselves into the sisters shoes and to ask the same questions for ourselves. Though dressed in period costumes (Ilona Somogyi, design), the characters sound modern, using a hefty amount of humor (as well as a lot of taking God's name in vain), to bring to mind situations we are reading about in today's headlines, like whether government should provide welfare for the poor, how difficult it is to find self worth while working an unsatisfying, poor-paying job and whether the elderly should be viewed as valued members of society or tossed out to make way for the young. Les Waters directs strong performances (Reddin stands out). One of the highlights also is Annie Smart's two-level set that shows the interior of the sisters' home on the stage level, with windows and a beckoning forest outside three windows on the top. A scene with snow falling (Alexander V. Nichols, lighting design), is particularly lovely. The production runs at the University Theatre, 222 York St., New Haven. Tickets range from $20-$88, are available online at www.yalerep.org, by phone at (203) 432-1234, and in person at the Yale Rep Box Office (1120 Chapel St., at York Street). Student, senior, and group rates are also available.